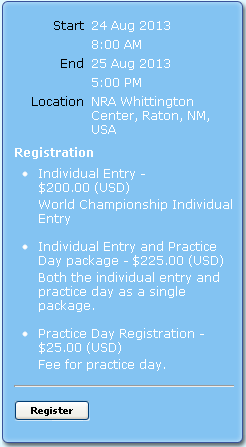 Entry registration for the 2013 F-Class World Championships in Raton, New Mexico is now open on the Bald Eagles Rifle Club website. Beverly Bartholome notes: “Before registering for the 2013 FCWC please go to the F-Class World championships web site http://fcwc-usa.org/. Under ‘Entries’ read both the entire Program and the Information Packet.” You’ll find info on matches, awards and entry requirements. Plus links within the program take you to the FCWC and FCN entry forms. Share the post "Registration Opens for 2013 F-Class World Championship"